Crapo, Maryland is located in Dorchester County, in the southeast corner of the state. It's situated between Lakesville (to the north) and Wingate (to the southeast), on the eastern shore of Maryland and is about 20 miles south of Cambridge. 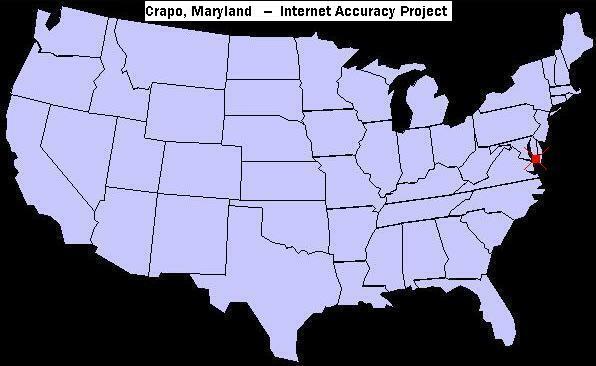 Time Zone: Crapo, Maryland is in the Eastern Time Zone. Boating, canoeing, birdwatching, hunting, crabbing and fishing, are a few of the outdoor recreational opportunities that abound in the region. Deer, raccoon, muskrat, otters, herons, egrets, sandpipers, ospreys and eagles are some the varied wildlife found in the area's tidal marsh habitat. Crapo is of French origin and is derived from the French word for toad, "crapaud" (this will come as a disappointment to some of you, but it's usually pronounced "CRAY-Poe"). If you find the above data useful, consider recommending Internet Accuracy Project to your friends and colleagues. Thank you in advance!